^ Stevens, David; Stevens, Carol (2008). "The Hobbit". In Bloom, Harold (ed.). J. R. R. Tolkien. Chelsea House. pp. 17–26. ISBN 978-1-60413-146-8. ^ Lazo, Andrew (2008). "Gathered Round Northern Fires". In Chance, Jane (ed.). 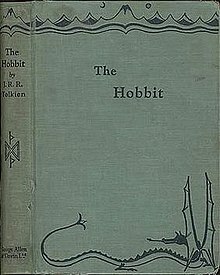 Tolkien and the Invention of Myth: A Reader. University Press of Kentucky. pp. 191–226. ISBN 978-0-8131-2301-1. ^ a b c d e Sullivan, C. W.; C. W. Sullivan (1996). "High Fantasy". In Hunt, Peter (ed.). International Companion Encyclopedia of Children's Literature. Taylor & Francis. pp. 309–310. ISBN 978-0-415-08856-5. ^ Faraci, Mary (2002). "'I wish to speak' (Tolkien's voice in his Beowulf essay)". In Chance, Jane (ed.). Tolkien the Medievalist. Routledge. pp. 58–59. ISBN 978-0-415-28944-3. ^ Elliot, Ralph W. V. (1998). "'Runes in English Literature' From Cynewulf to Tolkien". In Duwel, Klaus (ed.). Runeninschriften Als Quelle Interdisziplinärer Forschung (in German and English). Walter de Gruyter. pp. 663–664. ISBN 978-3-11-015455-9. ^ Auden, W. H. (2004). "The Quest Hero". In Rose A. Zimbardo and Neil D. Isaacs (ed.). Understanding the Lord of the Rings: The Best of Tolkien Criticism. Houghton Mifflin. pp. 31–51. ISBN 978-0-618-42251-7. ^ Smith, Thomas (2005). "The Folly of the Wise". In Koivukoski, Toivo; Tabachnick, David (eds.). Confronting Tyranny: Ancient Lessons for Global Politics. Rowman & Littlefield. pp. 217–218. ISBN 978-0-7425-4400-0. ^ Tolkien, J. R. R. (1981). Humphrey Carpenter; Christopher Tolkien (eds.). The letters of J.R.R. Tolkien. Boston: Houghton Mifflin. ISBN 978-0395315552. OCLC 7671235. ^ a b "William L. Snyder". genedeitchcredits. Gene Deitch. 6 January 2012. Retrieved 17 January 2012. ^ Aarseth, Espen (2004). "Quest Games as Post-Narrative Discourse". In Ryan, Marie-Laure (ed.). Narrative Across Media: The Languages of Storytelling. University of Nebraska Press. p. 366. ISBN 978-0-8032-3944-9. Tolkien, J. R. R. (1988) . Anderson, Douglas A. (ed.). The Annotated Hobbit. Houghton Mifflin Company. ISBN 978-0-3954-7690-1. Tolkien, J. R. R. (2003) . Anderson, Douglas A. (ed.). The Annotated Hobbit. London: HarperCollins. ISBN 978-0-00-713727-5.